I had some different cookies in mind when I made these, but then ate these instead because they were delicious. I was looking for some sort of soft, chewy, flatter gingery molassesey cookies, but these will do. I'll find that recipe someday, but in the meantime, enjoy this one! I made these cookies fairly large, but you can make them smaller, just adjust the baking time accordingly. Beat shortening, brown sugar, molasses and egg until smooth. Stir together the dry ingredients except the granulated sugar, then stir into the shortening mixture. Cover and refrigerate 2 hours. Preheat the oven to 375. Roll balls of dough about the size of a golf ball in sugar, then place a few inches apart on a cookie sheet. Bake about 14 minutes, until cracked and starting to brown. I baked six at a time, and made about a dozen and a half. mm yum, these sound simple and delicious. Sometimes the best recipes are made when we're trying to remember others. I've done it a couple of times! I think I have the recipe you were looking for. 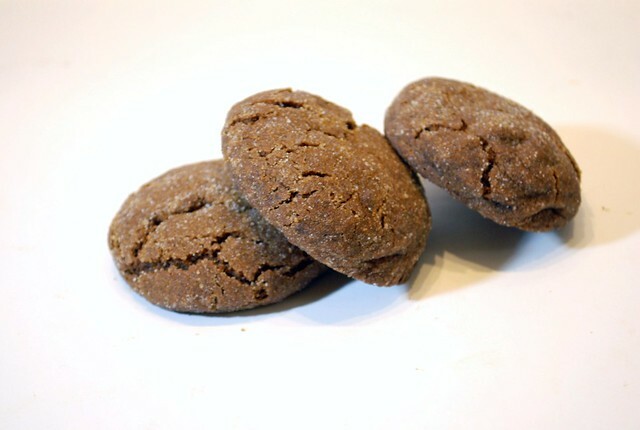 The molasses cookies I make are the soft, chewy, flat, and gingery cookie you're describing. You'd have to swap out the AP flour for your gluten-free flour mix but I don't see why they wouldn't be a perfect match for what you were going for.